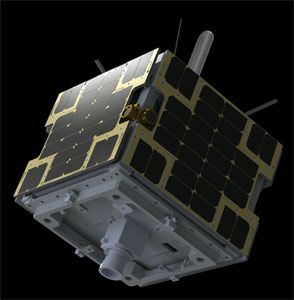 Experimental small satellite bus; carried an Automatic Identification System (AIS) receiver for tracking ships. Technology, maritime surveillance satellite for Dauria Aerospace, Russia. Launched 2014. Status: Operational 2014. First Launch: 2014-07-08. Last Launch: 2014-07-08. Number: 1 . Gross mass: 27 kg (59 lb). Apogee: 638 km (396 mi). Country: Russia. Launch Vehicles: R-7, Soyuz-2-1B. Launch Sites: Baikonur LC31. DX 1 - . Mass: 27 kg (59 lb). Nation: Russia. Spacecraft: DX 1. USAF Sat Cat: 40071 . COSPAR: 2014-037C. Apogee: 638 km (396 mi). Perigee: 624 km (387 mi). Inclination: 98.40 deg. Period: 97.33 min. Experimental small satellite bus; carried an Automatic Identification System (AIS) receiver for tracking ships..